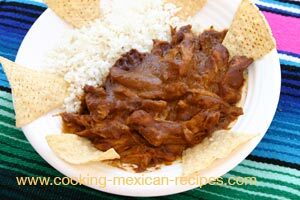 Our chicken mole recipe is easy to make and the results are delicious. Mole sauce, pronounced Mow-lay, is a rich multidimensional sauce with a hint of sweetness and chocolate to round out the spicy elements. Mexican mole can be served in burritos, tacos, or straight up with spanish rice and refried beans. This is a great dish to make for a party as you can make it up a day or two ahead of time. If you are making this for a party, you can serve it up in a chafing dish which will keep it warm through out your party. Feel free to spice up this recipe as much as you like by adding the optional chipotle peppers. My family does not like their chicken mole very spicy so I leave this out. It’s perfect for kids. The chile pepper and smoked paprika give just a little kick that’s not over powering by any means. Want A Shortcut To Make This Faster? Here are a couple of things you can do to speed up our chicken mole recipe if you want to serve dinner real quick. Buy a rotisserie chicken, remove skin and debone. Shred or chop chicken into bite size pieces and proceed from there. Serve this over instant white rice and make burritos. Top with grated cheese. In a stock pot add the chicken broth, orange juice, and tequila over low heat. Brown the chicken thighs in a frying pan with the olive oil over medium heat. Cook 2 to 3 minutes per side. Partially cover to keep the splatter down and to keep you from getting burned. As the chicken pieces get done, place them into the stock pot with the chicken broth. Once all the chicken is done browning, simmer the chicken in the stock pot with a lid for 30 minutes. Remove the chicken to cool. In the frying pan that you used to brown the chicken, add a touch more olive oil and add the minced onion and cook, stirring frequently for 20 minutes over medium to low heat. The onion will cook down and turn a nice golden brown. This is where the good flavor develops. Now add the minced garlic and stir frequently for 3 minutes. The wonderful smell should over take you. Add the almonds, coriander and cumin to the onion/garlic mixture and saute for two to three minutes more. Simmer the sauce for 10 minutes. Stir occasionally. In the mean time de-bone the chicken and tear or cut into bite size pieces. Let the sauce cool for 10 minutes and then pour into a blender and puree the sauce for 20 seconds. Pour the sauce back into the pot and add the chicken. Reheat on the stove until the chicken is heated through and serve. Our chicken mole recipe goes perfectly with spanish rice and refried beans. Return from Chicken Mole Recipe to More Mexican Food Recipes.